We currently have six internal club 'league' competitions spread through the season. These are not just for the competitive photographer but are an ideal opportunity to have your work critiqued by a judge. (Members may have their images critiqued and not scored by the judge but must inform the Competition Secretary in advance. However, they will not be included in the Club league system). Images are required to convey the set subject for just two of these competitions. This season 2018/19 the set subjects are FACES/FEATURES and DAWN/DUSK. Images for the remaining four competitions can be of the authors choosing. These are called 'OPEN' competitions. Images will be scored by the judge out of 20. 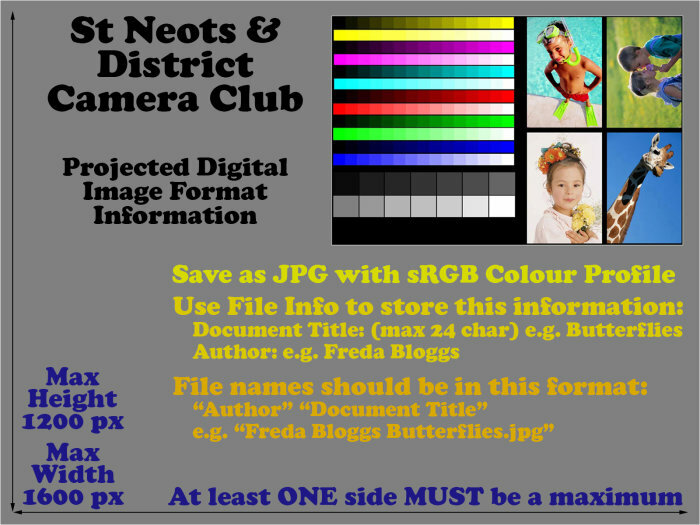 Both prints and digital images are handed in the week prior to the competition to be collated for the judge, (prints to the Competition Secretary and digital images to the Projectionist). They can be collected back on the evening of the competition. Our External Competition Secretary will be holding back many prints for selection into external competitions.